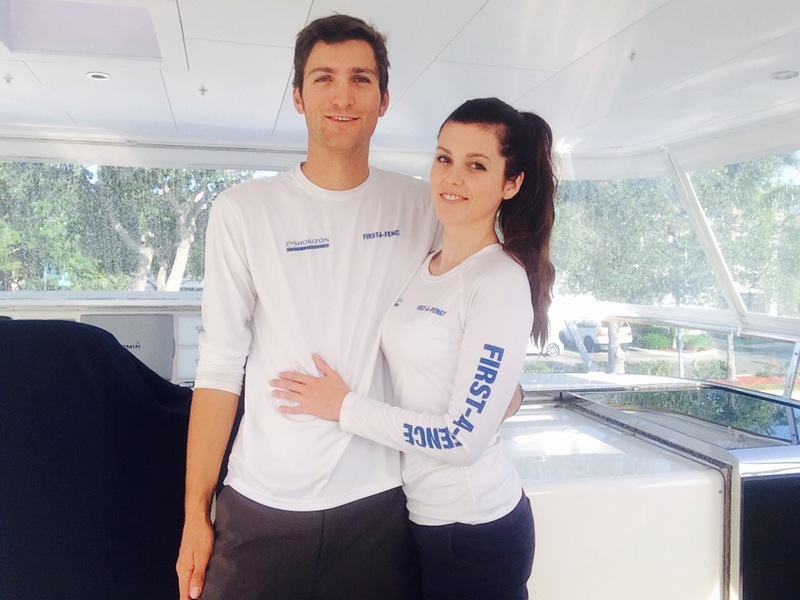 Motor Yacht First-A-Fence, originally known as ‘Blue Horizon’ was the first 60ft Power Catamaran built by Horizon in 2012. 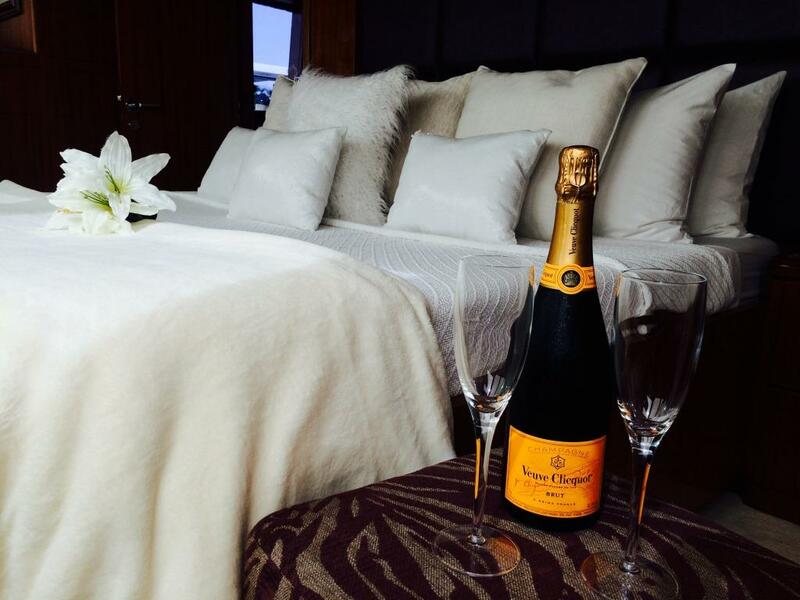 First-A-Fence offers accommodation in 4 cabins, the Master being situated on the main deck and the VIP is starboard forward. 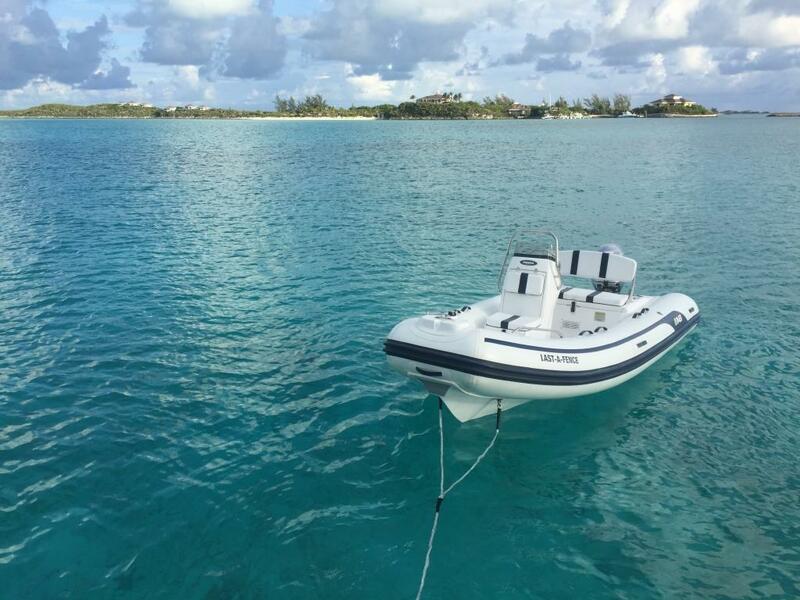 She is available for crewed charters with up to 8 guests. 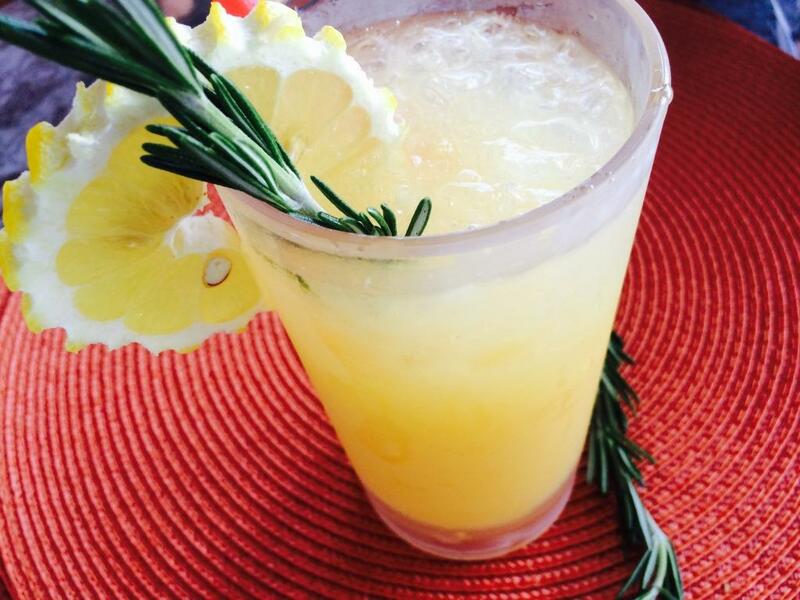 First-A-Fence measures 60ft (18.3m) in length and comes with a dedicated crew of 2. 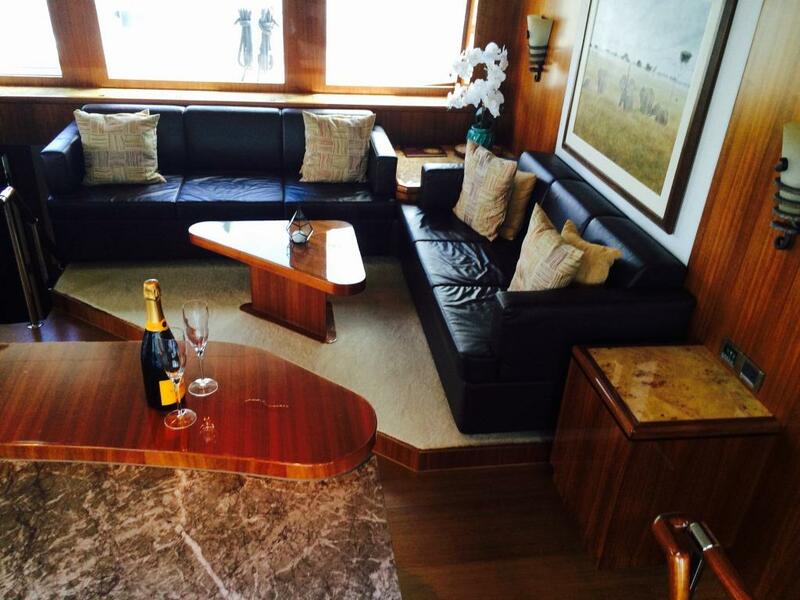 Charter yacht First-A-Fence has an elegant interior of beautifully furnished wood floors and plush leather soft furnishings. 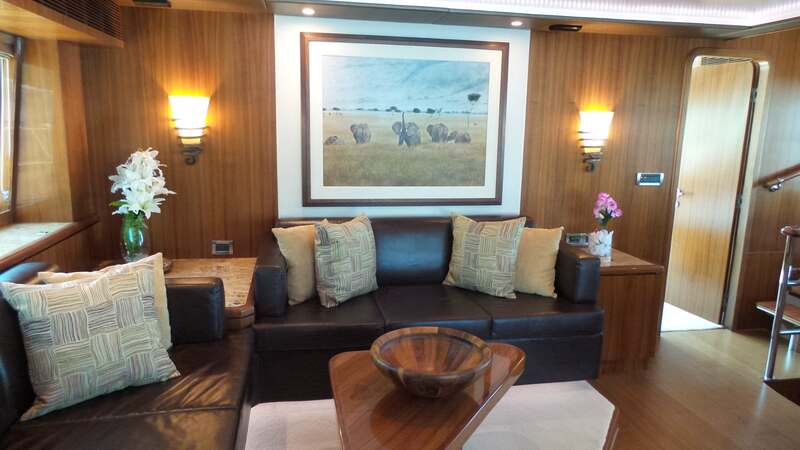 The décor is minimalistic with African embelishments and is warm and welcoming. Upon entering the salon is the open planned galley which features a large breakfast bar with fitted stools- perfect for entertaining!. 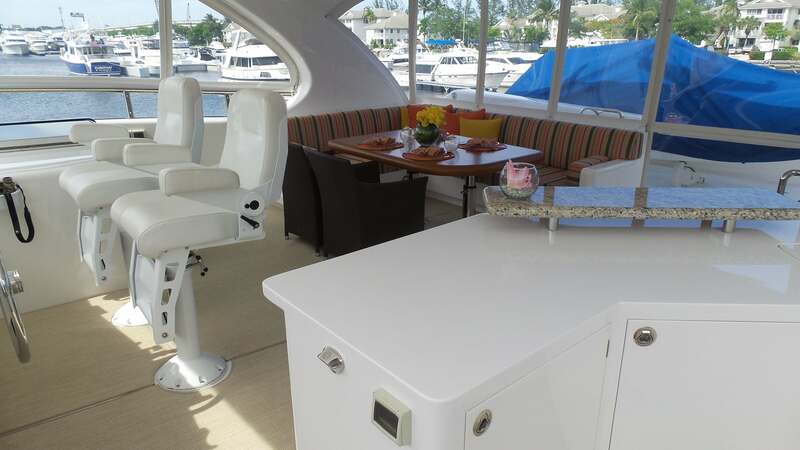 The salon features a large lounge area with an L shaped sofa, coffee table and an artfull ascending staircase to the fly bridge. 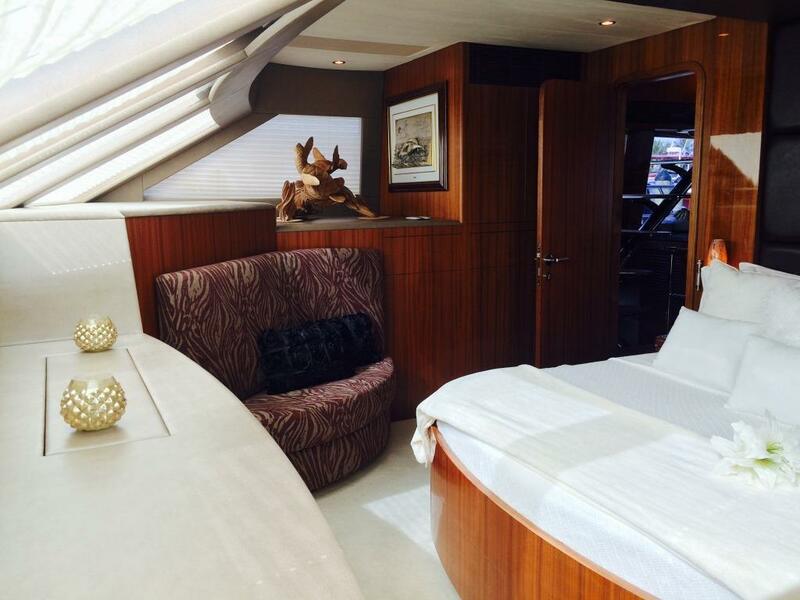 Forward of the salon is the full beam master cabin with a king sized bed, sofa, pop up TV, vanity and en-suite facilities. 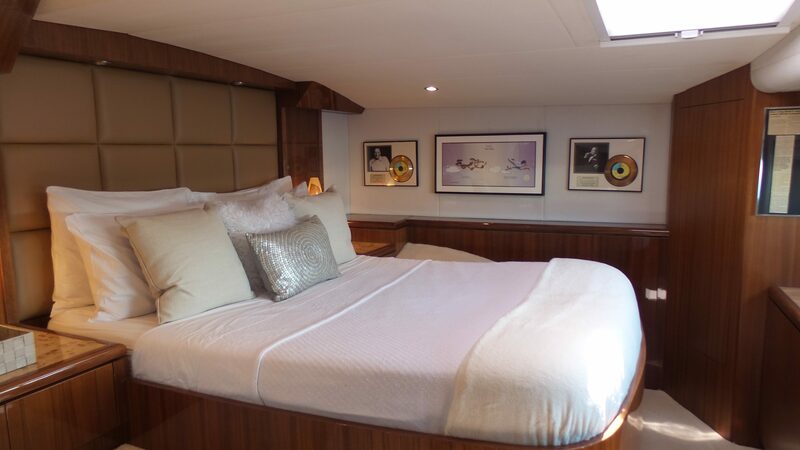 The VIP Cabin, fitted with a queen sized bed is in the starboard forward hull with a TV and en-suite facilities. 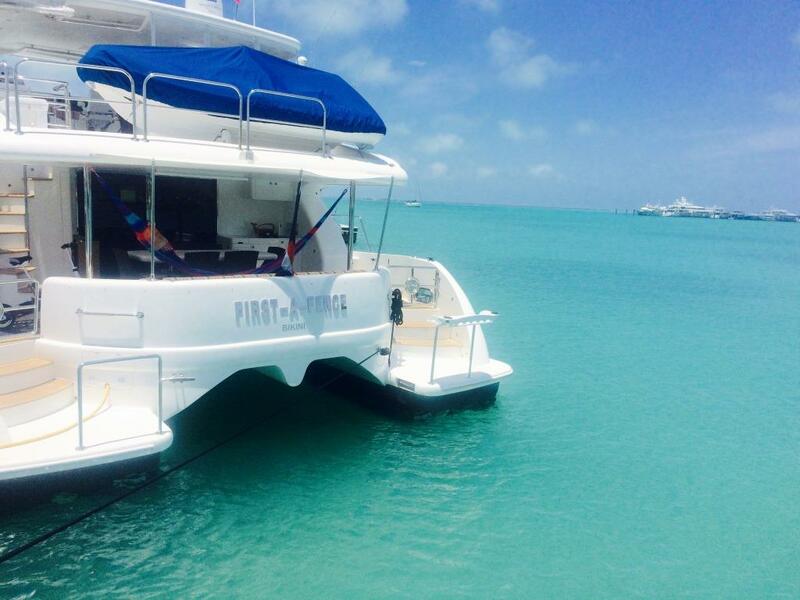 The boat is entirely air conditioned and has wifi access (location dependant). 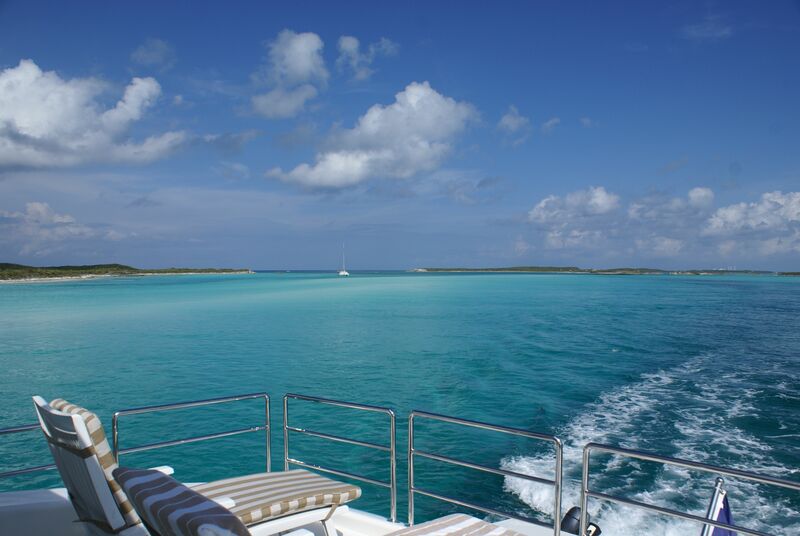 Power Cat First-A-Fence is the perfect yacht for a Bahamas charter, offering ample exterior decks to relax and entertain. 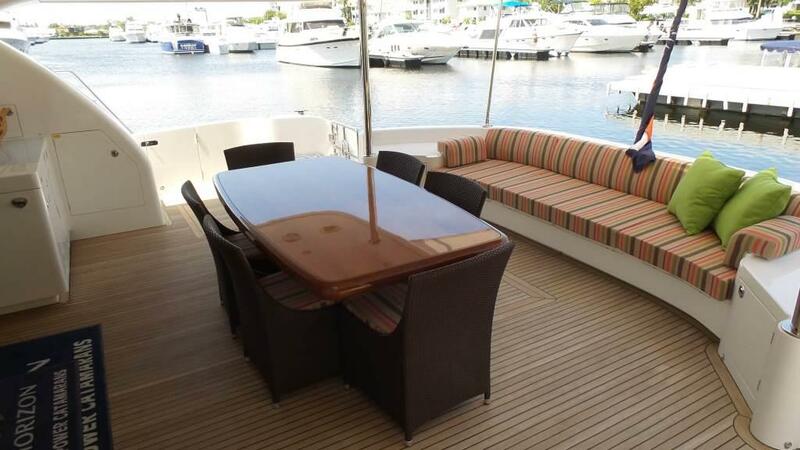 The aft deck is home to a large dining table as well as a vast seating area and is shaded by the upper deck, making it an ideal spot for outdoor dining and afternoon naps. 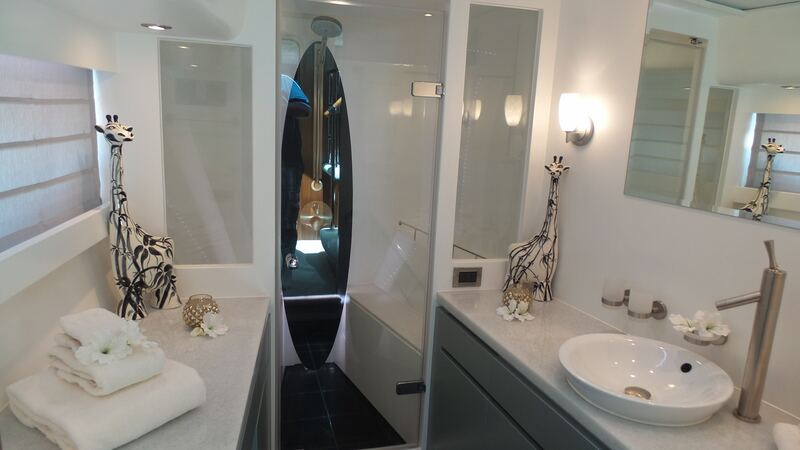 Wide walkways wrap around the catamaran leading to the spacious foredeck and comfortable sun pad. 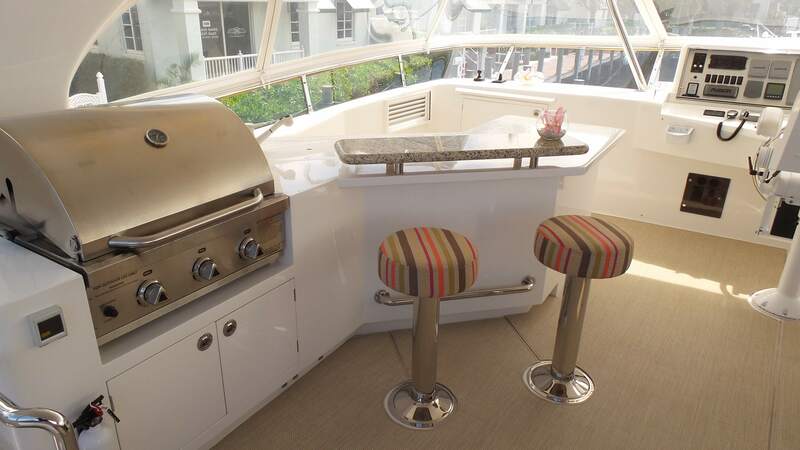 The fly bridge boasts an additional dining option with ample seating, wet bar with fitted stools, large BBQ and sun loungers for a mid day mojito or a sundowner spritzer. First-A-Fence runs on two Cummins 705hp engines. She cruises at 18knts and can reach up to 22knts. 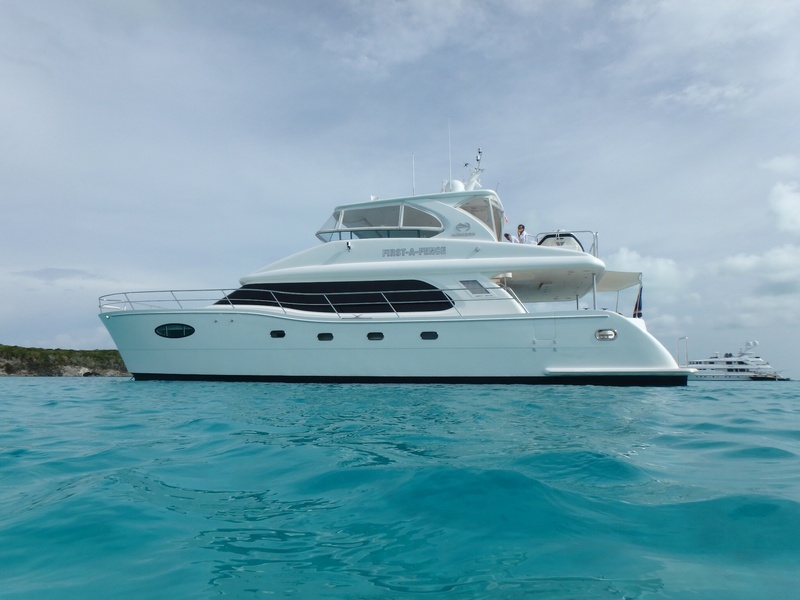 The yacht is known for its stability and comfort during passages and with a draft of only 5ft. 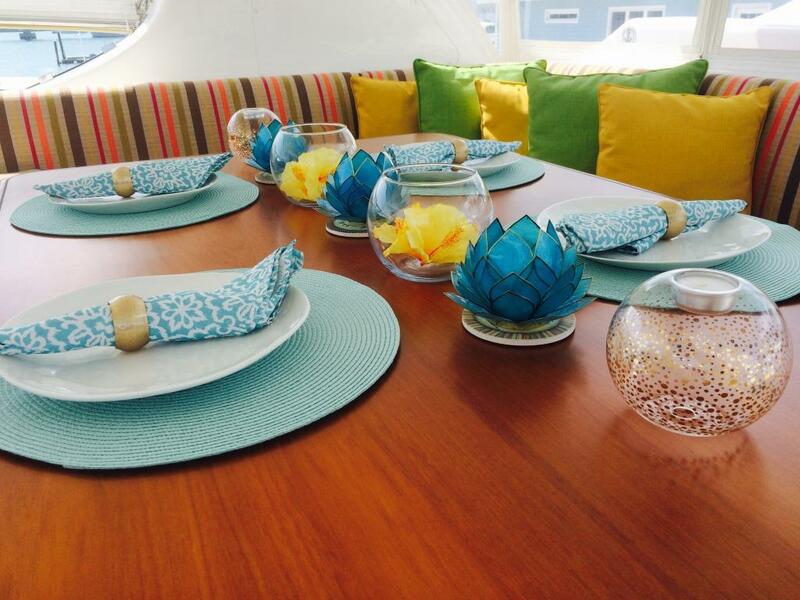 Accommodation is in 4 ensuite double cabins for 8 guests. 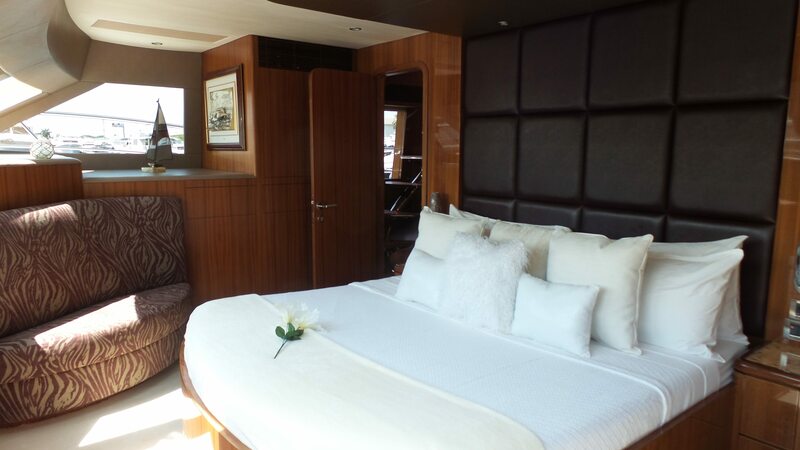 Forward of the salon is the full beam master cabin with a king sized bed, sofa, pop up TV, vanity and en-suite facilities. 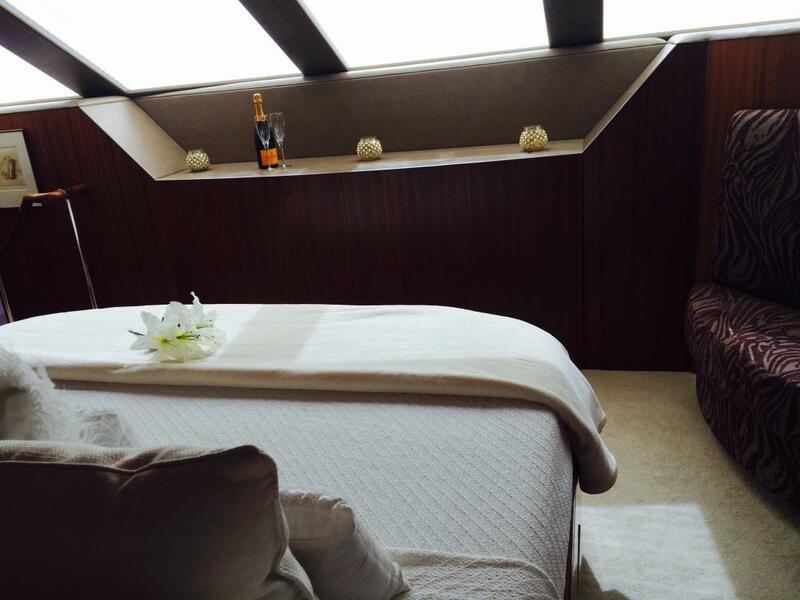 The VIP Cabin, fitted with a queen sized bed is in the starboard forward hull with a TV and en-suite facilities. 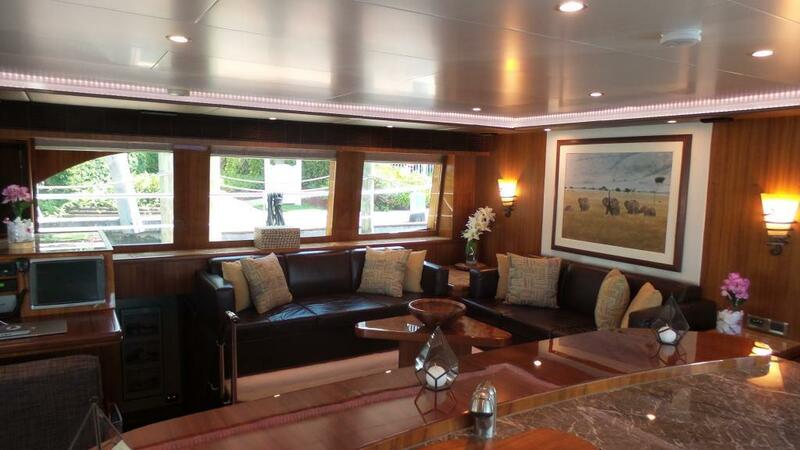 The boat is entirely air conditioned and has wifi access (location dependant).